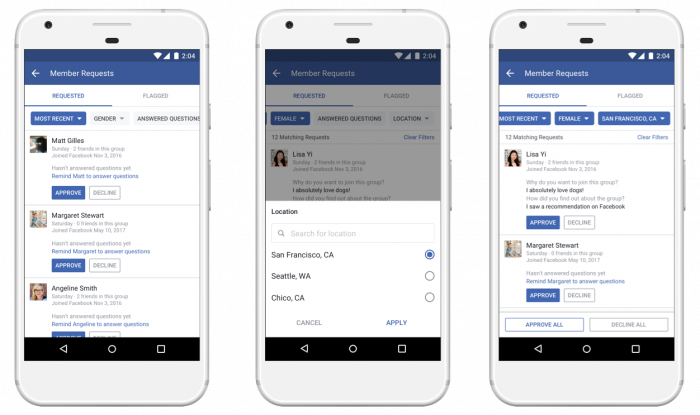 Facebook is rolling out new features for Group admins that will aid in the management of members and content. As I type this, I don’t yet have most of these features. TechCrunch wrote a terrific recap of these updates, and the images below come from that article. 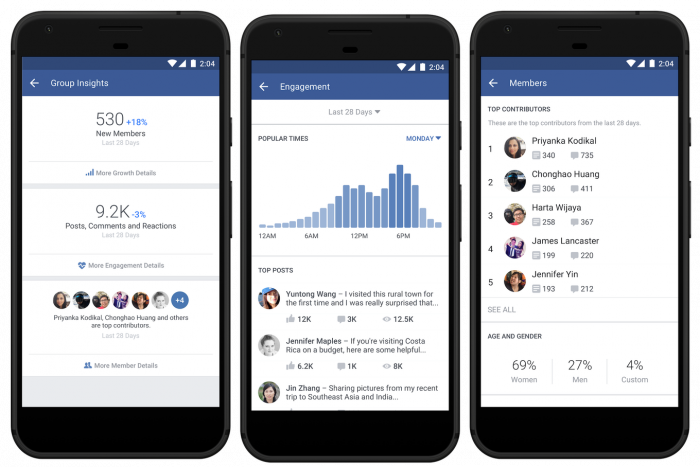 One primary complaint from Facebook group admins has been the lack of any access to metrics regarding the activity of members. 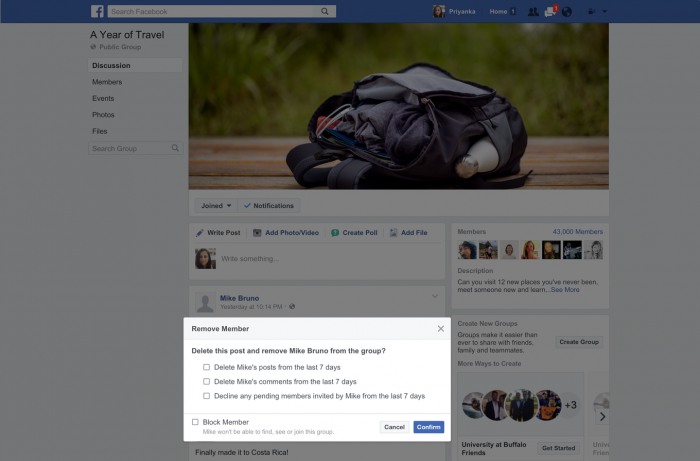 Third party tools have sprung up to fill this void in the meantime, but Facebook now provides a native solution. New Members: How many new members have been added in the past 28 days, and what is the percentage of growth? Posts, Comments and Reactions: Total number of posts, comments and reactions, and how that compares to the prior period. You can select from multiple time periods. Popular Times: A graph charting activity level by time of day and day of the week. 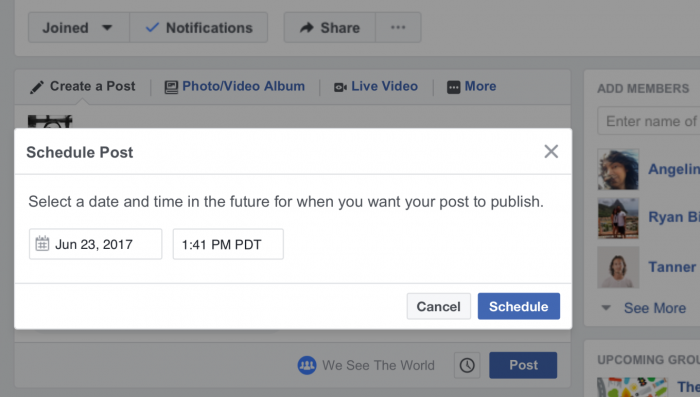 This can help determine the best time to post content or host group events. Top Posts: A collection of the posts that received the most likes, comments and views during the selected time period. Learn from what made those posts successful. Top Contributors: A ranking of the membership who contributed the most posts and comments during the past 28 days. This could be an opportunity to recognize, honor, or give back to those who contribute most. Age and Gender: A breakdown of your membership by gender. This could potentially influence how you market, run ad targeting, and communicate. This may only be a sampling of the Insights that will be available, based on the screen grabs from TechCrunch. Facebook has provided few details. This feature could be particularly useful for closed groups that get a high volume of requests to join. Filter pending members by gender and location (though it’s not clear if there is any other filtering available). You can then bulk accept or decline based on that filter. TechCrunch notes that the danger of this filtering is that admins could exclude people they should not. However, I doubt most admins will be using this to bulk accept/deny without looking more closely. If I had the feature, I may use it to prioritize my membership request workflow. Of course, that may not cut down on the work of an admin. It’s not nearly as valuable as the screening questionnaire that allows admins to ask questions of those requesting access (we use this for PHC – Elite!). It’s not clear if admins will be able to clean up in bulk beyond this seven day period, but it’s a start. A small thing. And really, why in the world wasn’t this available before? But the absense of this feature in the past has been frustrating and annoying. As a result, the addition of this “small thing” is actually kind of a big deal. Group admins will be able to schedule posts for a specific day and time just like they can for pages. This becomes additionally useful now that we have metrics from Group Insights indicating the times of day members are most active. This is a huge deal for me. My private communities are successful because of the peer-to-peer sharing, not because I’m in there every minute of the day. However, I do wish I could have a larger presense there, even if it’s to simply share more. I read a lot, and I share what I learn by scheduling to Twitter. Now I can grab some of the most important posts and schedule them via my relevant groups. Admins can link related groups that they manage. This allows them to surface and recommend that related group to members, making it more likely that members of one group join another. Facebook says that this is just the beginning of their attempts to bring communities and sub-communities together. 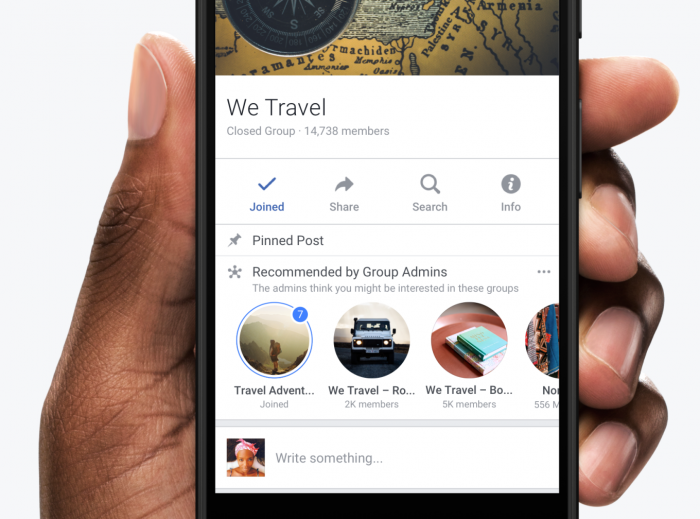 This particular feature will be great for free, open groups. It won’t be particularly useful for my premium groups as it will only create confusion when a member attempts to join a related group that they aren’t currently paying for. I’m looking forward to getting my hands on these features. Do you have them yet? What do you think?